Just like in fashion, different crafts rise and fall in popularity. Quilting, however, never really goes out of style, it simply reinvents itself over and over, evolving from simple necessity to art form. 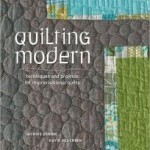 Here are some of the latest quilting books that blur the line between art and craft. 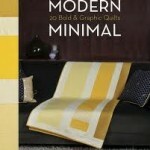 Modern Minimal by Alissa Carlton – Quilts get super sleek and ultra modern with these gorgeous graphic designs that use lots of white space to show off the simplicity of the quilting. Add a splash of sophistication to any home by draping one over a bed, a couch, or change the color palette to make one for baby’s room. These beginner-friendly quilt projects work well with any décor, in any room, and for everyone in the family! Quilting Modern: Techniques and Projects for Improvisational Quilts by Jacquie Gering – From two pioneers of today’s modern quilting movement, “Quilting Modern” teaches quilters how to use improvisational techniques to make graphic, contemporary quilts and quilted project with seven core techniques and multiple projects using each technique. 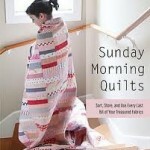 Sunday Morning Quilts: 16 Modern Scrap Projects by Amanda Nyberg – features 16 bold and scrappy projects including piecing, appliqué, and improvisational work as well as expert hints and tips for adapting patterns to your own style, and effectively cutting, storing, and organizing your scraps. 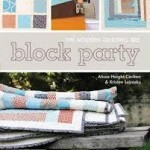 Block Party – the Modern Quilting Bee: the Journey of 12 Women, 1 Blog and 12 Improvisational Projects – Twelve chapters (one for each month) showcase the designs of today’s leading modern quilters along with easy-to-follow guidelines, so you can reinvent their work in your own signature style. With this book in hand, you’ll have everything you need to start your own online quilting bee and enjoy collaborating with other fabric lovers around the world. 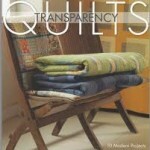 Transparency Quilts: 10 Modern Projects by Weeks Ringle teaches you how to use traditional piecing techniques to create layered translucent effects. By learning how to distinguish and balance the subtleties of color in your fabrics, you can achieve remarkable results. You’l l also discover how the visual relationships between different colors make all the difference in your quilts.